Back on Biscayne Bay we were having great fun chasing some of the larger boats (which will remain nameless) that were also out on test sails after the show. Trimming the headsail with the floating single-point friction ring takes a bit of getting used to, but when we had both sails happy, we topped 6.5 knots in a faltering breeze. Coming about was easy, quick and relatively quiet without the traditional main and headsail hardware clanging about. The 349 accelerates smartly. Steering was easy and quite pleasurable. With the sheet leads led to port helm, fiddling with trim was up to the helmsman, and the rest of us enjoyed the ride. 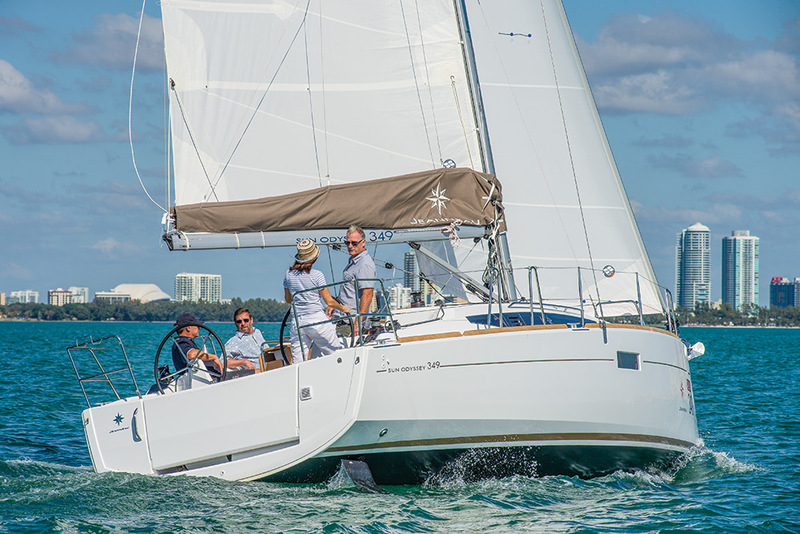 The new Jeanneau Sun Odyssey 349 is poised for a successful production run. It pushes the right buttons and delivers the essentials: good performance, comfort above and below decks and attractive pricing. The fact that it is produced by a premier builder with a long track record and terrific customer service is just another bonus. LOA 33’ 11”; LWL 30 ’10”; Beam 11’ 3”; Deep draft 6’ 6”; Shoal draft 4’ 11”; Ballast standard 3,484 lbs. ; Ballast shoal keel 4,101 lbs. ; Displacement 11,797 lbs. ; Sail area 595 sq. ft.